From an organic farm in South Dakota comes a cookbook that encourages culinary enjoyment of every season. 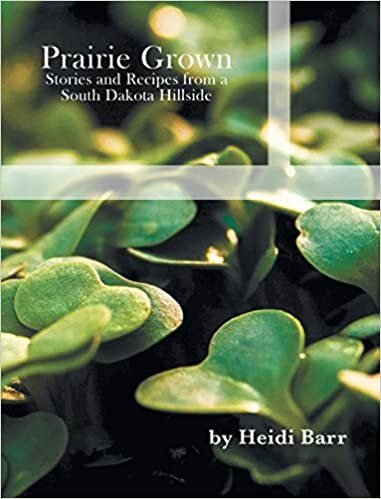 Prairie Grown: Stories and Recipes from a South Dakota Hillside is a book that will nourish your soul and body. It sets the table with beautiful, nutritious dishes. Taste the vibrant colors and the rich cultivation of the prairie hillside. As the producer of a food podcast for public radio, new cookbooks and guides to eating and living cross my desk daily. Prairie Grown stands out for its originality, simplicity, and clarity. Channeling Wendell Berry at his best, Heidi Barr’s personal and familial book of meditations and recipes resounds with a highly original voice of her own. Hers is an active and proactive philosophy, taking the reader through the seasons of growth and renewal tied to the land, its bounty and challenges. Highlights are photographs that draw the reader into Barr’s world, stories of and from her own extended family across the generations, and a powerful authenticity: Barr clearly practices what she preaches, an active philosophy that resonates from every page. This short, intimate book is like a gift of good food for body and soul, and like Barr’s delicious recipes, her writing will make you hungry for more. Like a lovingly prepared meal, Prairie Grown delights the senses on several levels. Barr’s calm and serene prose invites the reader to slow down and savor a progression through one year, beginning in January, when a garden is asleep under a snowy blanket. The recipes interspersing this progression reinforce an awareness of the here and how: the snow, the buds, the fruit, the harvest. The illustrations at the same time please the eye and emphasize the profound beauty that lies all around in a simple garden year. Sue Leaf, finalist for the Minnesota Book Awards & author of The Bullhead Queen: A Year on Pioneer Lake and Portage: A Family, A Canoe and the Search for the Good Life. Gregory Ripley, author of Tao Of Sustainability: Cultivate Yourself to Heal the Earth. As a new calendar year looms, while the ground it still covered in snow, I start thinking about seeds. In December and into January, the seed catalogues start to arrive, which leads to thinking about soil, planting the seeds, tending the plants, and the resulting harvest. Most large grocery stores in northern climates have fresh produce stocked all the time – even in the depths of winter. But that produce comes from Mexico and California and New Zealand and isn’t so “fresh” by the time it arrives at Cub Foods or Target, and it takes a whole lot of energy for those strawberries or bananas to be transported to their final destination. So despite the convenience of being able to walk into a store and get whatever I want, whenever I want it, I choose to embrace the benefits of sourcing fruits, vegetables and other food items from places closer to home. Or at home, in some cases. I try to do the bulk of my shopping at farmer’s markets and a small locally owned grocery to supplement what my family and I harvest from the garden. If I didn’t have the space or time or desire to tend a garden, I would probably be a member of one of the many CSAs (community supported agriculture) that serve my community. There’s nothing like going out to your yard or patio (or even windowsill!) to pluck a juicy red tomato from a vine or pick some lettuce for a salad. Anyone can do it-you don’t need a green thumb, years of experience or a 30 acre farm. All you need are some basic tools, a pot or spot in the yard with good soil, some seeds or seedlings, light, water and patience. For help in getting started with your own growing season, head to your library to borrow a book on gardening. Get to know that neighbor who is always out in the garden when you drive by on the way the work. Stop in at the local greenhouse. Many community education programs offer gardening classes, as do local extension services, through the master gardener program. But your best bet? Plant something and see what happens. Some things won’t grow. Last year none of my hot pepper plants came up. And some things will grow and then wilt before ripening, or get eaten by bugs. Or deer. But some things will grow and thrive, and it will be amazing. Trust me. Need some seeds? Seed Savers Exchange, located in Decorah, Iowa, is a non-profit dedicated to saving and sharing (non-GMO) heirloom and open-pollinated seeds. I get most of my seeds from them, in addition to the seeds that we swap with neighbors and those that are gifted by my organic veggie farming family, who you will learn more about later in this book. And better yet, consider becoming a part of a CSA – you’ll get to purchase a share of the season’s harvest (typically a weekly box, picked up at the farm, or at a drop location in town) and you will directly support a farm or garden in their mission to provide healthy food to the community. To learn about your CSA options, farmer’s markets and other sustainably produced food in your area, visit www.localharvest.com. There is such abundance to be found right where we are. Down the road at the market. In the neighbor’s chicken coop. Or in perhaps even in the front yard. This book is one part story and two parts recipes. It’s based on how life moves through the calendar year on the Midwestern homestead where I grew up, where my parents still live and grow vegetables to share with the community. It is my hope that the simple descriptions of how life on one farm unfolds month by month and the seasonal recipes included inspire you to embrace fully your own story and to spend part of it cooking and eating locally sourced food.